Steve Bailey: Has the League Cup had its day? Has the League Cup had its day? Is it a competition that should still be part of the domestic football calendar? In years gone by, it was fiercely fought and a competition which was taken seriously by top teams all across the country – Liverpool winning it four years in a row in the early 1980s shows that. Now? There seems little interest in it and, being totally honest, it feels like a waste of time. For quite a few years, teams have fielded second-string outfits as it’s seen as a distraction from league campaigns – and not in a good way. Manchester United boss Jose Mourinho even questioned a few weeks ago whether English football could survive without the cup. Attendances show it is not a priority for fans and the draws for this year’s competition turned it into a bit of a farce. Long gone are the two-legged cup ties. Albion had famous ties at the Goldstone Ground with Manchester United and then Leicester, both top division teams at the time. The penalty shoot-out victory over Manchester City at Withdean will also live long in the memory, but the competition now just seems to be a pale imitation of what it once was. The draws for this year’s Carabao Cup competition saw it become a laughing stock. Charlton were drawn twice in the first round, away to Exeter and at home to Cheltenham, then confusion reigned during the second-round draw with clubs unsure if they had been drawn at home or away. The third round was drawn from Beijing at 4.15am in the morning UK time, before the quarter-final draw was due to be streamed live on Twitter but was delayed by nearly two hours and ended up being live-recorded before being put out on the social media channel. The draws have certainly got people talking about Carabao but not in the way the energy-drink maker would like. The competition did not have a main sponsor last season and was known simply as the EFL Cup. First started in 1960-61, will it ever recover and get anywhere near back to the popularity it had during its heyday? With the amount of international and European football, it seems unlikely. While it’s great for teams at the bottom of the league pyramid to draw a big side, it’s not even the payday it once was with reduced ticket prices and a second-string Premier League squad on show. The big question is: Does it add anything to domestic football? Would it be missed if the competition were no longer around? From an Albion perspective, if they stay in the Premier League and become an established top-flight side, it may be the best way to qualify for European football. 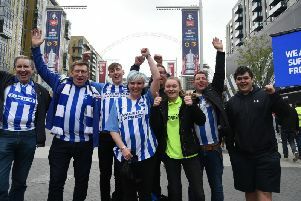 Reaching the final also gives fans a day out at Wembley but even then every Premier League side will play at the home of football this season when they play Tottenham away. Could it be revamped? Unlikely. It’s low down the list of priorities for clubs and few, if any, sides would set it as a target at the beginning of a season. Carabao’s sponsorship of the competition runs until 2020. It’s hard to see it gaining any popularity in the next three years. Will it continue for much longer after that? Only time will tell.